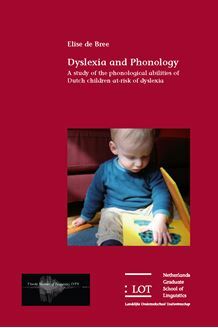 This thesis explores the phonological deficit of children with a familial risk of dyslexia. This approach contributes to the identification of possible linguistic precursors of dyslexia. The thesis is set within the framework of the phonological deficit hypothesis of dyslexia. Through assessment of performance of at­risk children on linguistically­based measures, as well as measures of phonological processing and awareness, this phonological deficit hypothesis can be tested and refined. Secondly, a comparison is made between the phonological abilities of children with a risk of dyslexia and children with specific language impairment (SLI). Both disorders are characterised by language and reading difficulties and it is investigated whether they are both caused by (similar) underlying phonological difficulties. This comparison contributes to the evaluation of hypotheses on the relationship between dyslexia and SLI. It is shown that children at­risk of dyslexia display more difficulties than normally developing children on tasks tapping into phonology. These findings confirm the phonological deficit hypothesis. They further show that a linguistically informed approach leads to new insights. Additionally, the at risk and SLI children generally show difficulties on the same tasks, but to a different extent and with different error patterns, indicating that dyslexia and SLI are best treated as separate disorders partly caused by a similar risk factor, i.e. poor phonology. This dissertation is of relevance to researchers in the fields of psycholinguistics, language acquisition, and reading and language disorders, as well as to clinicians working with dyslexic and/or language­impaired children.